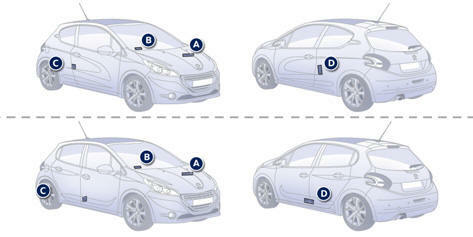 Various visible markings for the identification of your vehicle. A. Vehicle Identification Number (VIN) under the bonnet. This number is engraved on the bodywork near the damper support. B. Vehicle identification Number (VIN) on the windscreen lower crossmember. This number is indicated on a self-adhesive label which is visible through the windscreen. C. Manufacturer's label. The VIN is indicated on a self-destroying label affixed to the middle pillar, on the passenger's side. D. Tyre/paint label. This label is fitted to the middle pillar, on the driver's side. - the tyre inflation pressures with and without load, - the wheel rim and tyre sizes, - the brands of tyre recommended by the manufacturer, - the inflation pressure of the spare wheel, - the paint colour code.